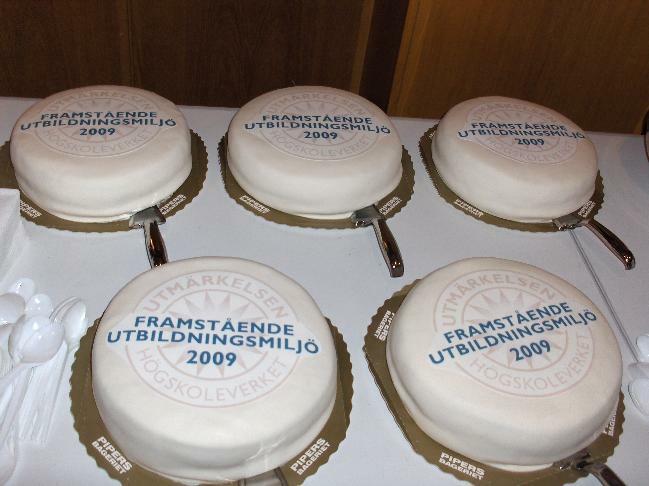 In 2009 the undergraduate education at CSC applied for the award Excellence in Higher Education Award (HSVs utmärkelse för framstående utbildningsmiljö). This web page contains the application documents and links to further information that could be valuable for the international reviewers. HSV gave us the award at a ceremony January 28, 2010. Report from the evaluation group. The criteria for the award can be found in appendix 8 in the HSV report describing the whole quality system. The KTH web had a short news item (in Swedish). Main application, base data and organization. Old version of the application from 2009-03-15 and the opinion on this version by our expert reviewer Lyle McGeoch. The panel of experts visited us October 20, 2009. The panel met three groups of six persons each during the afternoon in the Nada library. Here is more information about the visit and a list of participants from the school. Development plan for the undergraduate education at CSC 2009-2012, not yet formally accepted. Swedish Agency for Higher Education (HSV) subject assessment 2001 - Computer science. Swedish Agency for Higher Education (HSV) subject assessment 2002 - Mathematics. Ny Teknik article about the ranking of Swedish education programs 2007. ACM ICPC World finals in Stockholm 2009, world championship in programming. Note that these lists contain third cycle (research level) courses as well as undergraduate courses. Olle Bälter: Inside Information on Williams College from the Outside, 2009. Olle Bälter: Inspiration till nytt pedagogiskt tänkande (Inspiration for new pedagogical thinking, in Swedish), 2009. Viggo Kann: Report from my visit at Amherst College August-December 2006, 2007. Viggo Kann: Målrelaterade betygskriterier kräver modifierad examination - examination efter betygskriterier i en algoritmkurs på KTH (in Swedish), HSVs kvalitetskonferens 2007, Umeå. Viggo Kann: Effektiv, formativ och målrelaterad sluttenta (Efficient, formative and criterion-referenced final exam, in Swedish) Utvecklingskonferensen 2008, KTH. Viggo Kann: Lärarbemanning för kvalitet (Teacher manning for quality, in Swedish) HSVs kvalitetskonferens 2009, Stockholm. Björn Hedin: Program integrating course: A tool for reflection and quality management, Utvecklingskonferensen 2009, LTH.